I’ve been doing a lot of painting in the interior of our new home recently and as part of the process I’ve needed to patch a lot of small drywall holes caused by nails and screws that were used for supporting wall hangings. Consequently I’ve done my fair share of spackling walls to cover the nail and screw holes, and I thought I might share a few tips with you on this subject. You can purchase spackle in two forms, either in a lightweight pre-mixed compound form or in an all-purpose form. Both are elastic to help minimize shrinkage as they dry. I have exclusively used the lightweight pre-mixed spackle as it is perfect for filling small drywall holes caused by nails and screws. It contains a vinyl binding agent that is sufficient for patching small holes in areas where future damage is not expected, e.g. you’re not going to put another nail hole very near the same location. The all-purpose spackle type contains acrylic and is the perfect type for filling larger holes up to three quarters of an inch in diameter. Prior to filling the small drywall hole with spackle clean the area with a putty knife or fine sandpaper. Also make sure there is no protrusion from the hole. If so, push it into the hole with your putty knife of finger. The goal is to create a flat surface that will allow the spackle to bind well with the drywall surface. I use the pre-mixed spackle paste for patching the nail holes. Just make sure it is well mixed before using it and put the lid on tight when you’re done with it so it doesn’t dry out. You can also purchase powdered spackling compound and mix it with the requisite amounts of water until it has the right paste-like consistency, but my view is why bother when you can buy it pre-mixed and it’s relatively cheap. Use the tip or edge of a putty knife to scoop a small amount of spackle out of the container. Scoop a little more spackle onto the putty knife then you think you’ll need to fill the hole. Then press the spackle loaded putty knife edge into the small drywall hole to fill it. 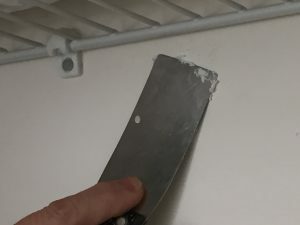 I prefer to fill the hole by placing the putty knife edge slightly above the hole and then swiping slowly down over the hole to fill it with the spackle. With the hole filed, use the putty knife to flair out and scrape away any excess spackle around the hole. You don’t need to fully clean the drywall surface. You just want to remove the significant excess material. Later, after the spackle has had time to dry a little, use either a fine grit sandpaper or a slightly damp sponge to remove any residual spackle compound from the wall near the patched hole. A couple hours later check to see if the spackle patch has remained flush with the wall surface. If it has recessed a little due to the spackle shrinking, repeat the process to eliminate the recessed dimple. Once you’ve confirmed that the dry spackle is flush with the surrounding wall surface, lightly sand and dust off any final residual material with a rag. And with that completed, you’re now ready to prime and paint the wall.